I’ve done it! I really can’t believe it, but I’ve done it! 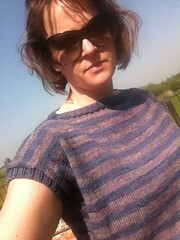 My Roxborough Dolman is (nearly) completed! I really didn’t think that I would finish my Roxborough Dolman top in time to meet the luvinthemommyhood knit along deadline, but I just abut got there in the end. I have a fair few ends to weave in and I need to block it to even everything out, but I am so pleased that I basically got it done in time….rather painfully I’ve had to do a bit of knitting in the sun…how terrible! As I say, I’ve not blocked it yet, but it seems to fit ok and I think it may look alright too – fingers crossed. 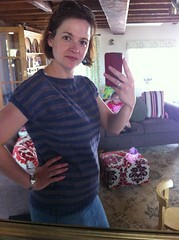 Thanks to Shannon from luvinthemommyhood for hosting the KAL, it’s been fun and I’ve ‘met’ some lovely new people. 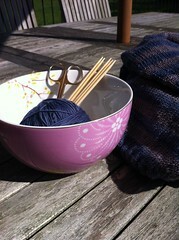 I am already looking forwards to the summer sweater KAL. I’ve picked out two patterns and even have the yarn for one of them. Nothing like being optimistic! !